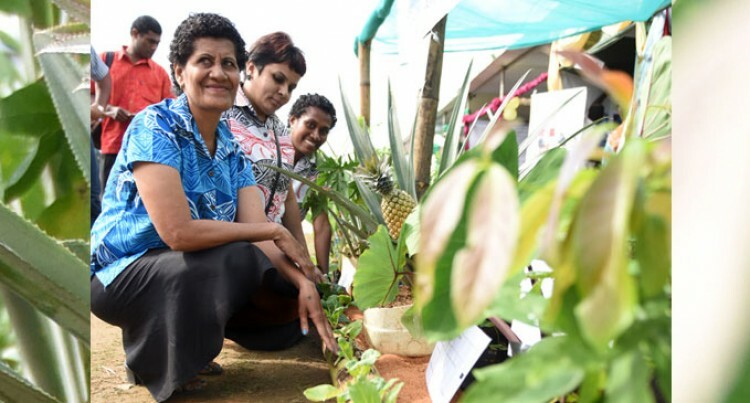 If you’re a farmer in the city and are short of space for farming, you need to go to the Central Division Agriculture Show at Syria Park in Nausori. One of the many stalls at the show displays ways to farm for an average ‘urban farmer’. An eye catching method is the Banana Culture. Ministry of Agriculture extension officer – Nausori Joji Cavalevu explains the idea of Banana Culture. He said: “The city people don’t have the luxury of farming due to space and land. Banana Culture is simply planting crop inside a banana trunk. Mr Cavalevu explained the process: “You cut the trunk of the banana and you leave it for some time so that it dries up then you make holes in the trunk itself. “You then mix soil with poultry manure, we use 1:2 ratio i.e. one spade of poultry manure with two spades of soil. The idea of Banana Culture had emerged from a visit overseas. Mr Cavalevu said: “I actually went for training in Philippines and that was where I got the idea from. He added the Banana Culture is some of the ways farmers in the city can plant crops instead of using pots and plastic buckets and it is also another way to recycle. The Agriculture Show is a platform for farmers to come and learn new ideas and methods of farming. “Through this Agriculture Show, we can help give new ideas as to how they can utilise they available resources to produce their own food which is healthier than buying,” Mr Cavalevu said. But he urged farmers to go to the show and have a look at the new ideas of farming.